One of my favorite things about the Maple Grove real estate market is the diversity that exists within the market. With expansion beginning in the 1970s, picking up steam in the 80s and continued commercial and residential development showing little slow down from the real estate “issues” since 2006, Maple Grove has continued to add 10,000 plus new residence in each decade since the expansion started. As a result of the growth, it is important to remember that Maple Grove offers an abundance for all home buyers in today’s market. 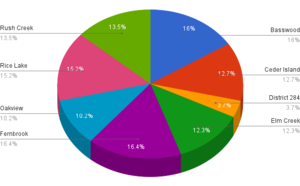 To focus more on the market breakdown within Maple Grove’s first quarter 2016, it may be worth a look at new listings broken down by individual area breakouts, as defined by the school districts. Once again, the Basswood area leads all areas with supplying the Maple Grove real estate market with nearly 19 percent of its inventory. Of the 83 new listings, almost 35 percent of the homes were town homes or a condominium, keeping the opportunity open for home buyers in most price ranges. The Cedar Island area accounted for just less than 10 percent of the new listings coming to the Maple Grove market with 43 new homes coming to the market through first quarter 2016. This area did see a large increase in the amount of town homes hitting the market in 2016 with 21 new town home/condo listings compared to only 15 in first quarter 2015. 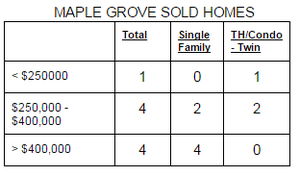 Always small, but always powerful, the Wayzata School District portion of Maple Grove saw 39 new homes hit the market. The number of listings were 34 percent from the previous year and accounting for nearly 9 percent of the Maple Grove market compared to just over 6 percent of all the new inventory a year earlier. The Elm Creek area saw the largest drop in the amount of homes hitting the Maple Grove real estate market during 2016 first quarter, with only 29 new homes to our inventory. That is down nearly 20 percent from the previous year and accounted for only 6.6 percent of first quarter inventory. This area does still lead in the percentage of single family home listing with 86 percent of the listing this year being single family. Fernbrook held steady during first quarter 2016 accounting for 16.6 percent of the Maple Grove supply of homes so far this year, almost exactly the same as last year (16.7 percent). 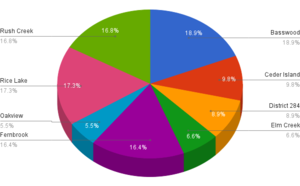 Of the 72 new listings, about 45 percent (32) were town homes or condominiums, up from only 35 percent last year. While remaining one of the smaller spaces in the Maple Grove market place, Oak View produced the fewest homes to the market during first quarter 2016 with only 24 homes coming to market, down 17 percent from last years numbers. It also produced the highest percent of town homes or condominiums to the market with only 50 percent of those homes being single family. While 76 new home listings during first quarter this year was down 5 percent from last years number, the Rice Lake area exploded in March with 41 new listings. 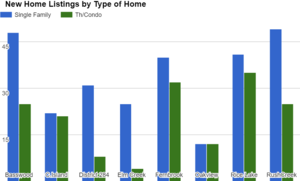 Down only to the Basswood community in March, this area is the second highest producer of homes to the Maple Grove market with just over 17 percent of all new home listings. The first quarter of 2016 was good to Maple Grove home owners in the Rush Creek area as this was one of the only communities that saw more home listing (74) than the same time period a year ago (62) accounting for nearly 17 percent of the Maple Grove housing market. Of the homes coming to the market, 66 percent were single family homes during this time frame. The Basswood area has consistently been the top Maple Grove area for new housing sales, however has temporarily lost it’s title after first quarter 2016. While still accounting for 39 new home owners, the 16 percent of all Maple Grove sales so far is down drastically from the 22 percent during the same time a year earlier. Cedar Island meanwhile has shown more strength as the 31 sales in this area was nearly 30 percent more than the previous year and this area has accounted for almost 13 percent of all Maple Grove first quarter sales compared to only about 10 percent last year. Consistently the smallest area of Maple Grove, the Wayzata Schools area saw a few more opportunities for home buyers and moved from seven sales a year earlier to nine sales during first quarter 2016. While the area did have strong demand growth, it also supplied the highest rise in supply growth as homeowners realize improvement in equity positions. A year ago, the Elm Creek area was exploding with new home owners and that trend carried throughout the year with Elm Creek showing the largest gains as percentage of home sales in 2015. Through first quarter of 2016, however, home buyers seem to be taking a bit of a breather as the 30 sales so far are off of the 34 sales a year ago. 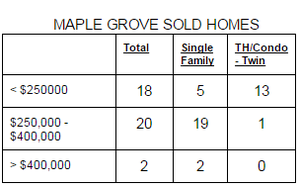 The 40 sales in the Fernbrook area through first quarter 2016 lead all Maple Grove areas and has accounted for 16.4 percent of all Maple Grove sales during this time period. Up nearly 38 percent from the previous year, Fernbrook area has seen the demand increase even while supply numbers have dropped. While still only accounting for just over 10 percent of all Maple Grove sales during the first quarter of 2016, the Oakview area did see the largest increase in sales numbers. Up to 25 sales from 18 a year ago, Oakview saw a 39 percent increase in sales numbers compared to first quarter 2015. 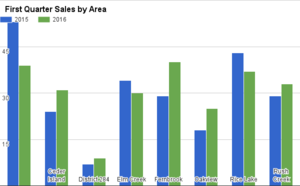 The Rice Lake community has experienced among the largest slowdowns in the Maple Grove sales during first quarter 2016, moving from 43 sales a year earlier to only 37 this year. While down about 14 percent as a whole, it’s easy to track the reason as new construction listings have dropped nearly 65 percent during this time frame as Donegal & Hightop developments come to completion. The Blue Ribbon school area saw 33 homes sales during first quarter of 2016, up 14 percent from the same time period a year earlier. This area also saw a large improvement on average sales price, moving it to number two on the area list of highest average sales price for the quarter. There has been a pretty even split of homes sales in the lower two price ranges in the Basswood community with 16 new homes owners in both groups. Those results show in the average price as the average sales price of a Basswood home is down about 12 percent so far in the first quarter to $310,194. The top price range (over $400,000), however, were cut by more than 50 percent from 15 during first quarter last year to only seven this year. While the other two price groups have remained flat compared to the previous year, we see that the average sales price also remains flat - up less than 1 percent to $197,195.This community has witnessed a boom in the market for homes under $250,000 with a 70 percent rise in the amount of homes sold to 22 during the first quarter of 2016. While the amount of home sales happening in the top price range remained constant at four compared to last year, both of the two lower price groups saw one more sale. Although still maintaining as the area with the highest average sales price, the Wayzata School District area of Maple Grove saw the first quarter average sales price drop to $370,288. With an average sales price of $203,889, it was nearly the equal to the average price for the same time period in 2015 ($205,355). The Elm Creek community again provided the most opportunity for Maple Grove home buyers in the “under $250,000” price category during first quarter 2016 with 26 new homeowners. Much of the push upward comes from the $250,000 - $400,000 price group as 20 new homeowners purchased in this group through the first three months of the year compared to eight in a year ago. The Fernbrook area average sales price for first quarter 2016 came in at $267,621, up from the same time period in 2015 by about 10 percent - the largest upward movement of any Maple Grove community. While producing larger numbers in each of the pricing categories, the two home sales (compared to zero last year) aided in the upward movement on prices. Another area that saw an increase in sales, the Oakview community also saw average sales price during the 2016 first quarter move up nearly 9 percent to $219,022. Sales where down during this time period in each of the three price categories, but down most significantly in the “over $400,000” category by 50 percent from eight last year to only four in 2016 first quarter. This area remains the fourth highest average price area in Maple Grove, despite dropping just over five percent from last years first quarter average sales price to $273,918. Coming in at $332,431, the average price in this area was propelled by 11 homes selling in the upper price range group compared to only four during first quarter a year ago. With an average sales price up over nine percent during first quarter of 2016, the Rush Creek area moved back to the number two on the Maple Grove area list.